A native of Calgary, Alberta, Estelle Choi began her musical studies at the age of five under the tutelage of John Kadz. After high school, she went on to study with Aldo Parisot at the Yale School of Music and Ronald Leonard at the Colburn Conservatory of Music. Her awards as a soloist include first prizes in the Canadian Music Competition, the Alberta Provincial Music Festival, and the Calgary Concerto Competition. Ms. Choi has performed concertos with the Colburn Conservatory Orchestra, the Calgary Philharmonic and Calgary Civic Orchestras and performed alongside her brother, Arnold Choi in a double cello concerto program with the Okanagan Symphony this past season. She has collaborated with renowned artists including Jean-Yves Thibaudet, John Perry, Paul Coletti, Joshua Bell, Anne-Marie McDermott, David Shifrin, eighth blackbird, and members of the Borodin, Ebene, Emerson, Tokyo, and St. Lawrence String Quartets. As the cellist of the Calidore String Quartet, Ms. Choi most recently received the 2017 Lincoln Center Emerging Artist Award and the 2016 M-Prize International Chamber Music Competition Grand Prize, the largest award for chamber music in the world. She has also received Grand Prize awards at Fischoff, Coleman, Chesapeake, and Yellow Springs competitions. The Calidore String Quartet is in residence with the Chamber Music Society of Lincoln Center’s prestigious CMS Two program. In 2016, the quartet became the first North American ensemble to win the Borletti-Buitoni Trust Fellowship and was named BBC Radio 3 New Generation Artists, an honor that brings with it recordings, international radio broadcasts and appearances in Britain’s most prominent venues, including London’s Wigmore Hall. Calidore most recently made their Hong Kong, Berlin, and Paris debuts this past season. Ms. Choi served as Artist-in-Residence at Stony Brook University from 2014-2016 and currently is a Visiting Guest Artist at the University of Delaware and Visiting Artist-in-Residence at the University of Michigan School of Music, Theatre and Dance. 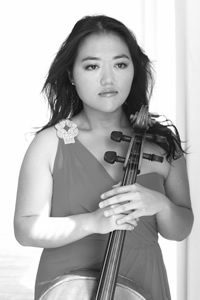 Ms. Choi holds a Master’s degree from Yale and an undergraduate degree and Artist Diploma from the Colburn Conservatory of Music. Read Estelle’s interview in the MSCM newsletter.